It’s been a year since 9-year-old Martavion Tinnel had a bone marrow transplant for sickle cell disease, and his doctor, Carrie Kitko, M.D., has just given him the OK to eat fruits and vegetables in restaurants again. “I’m having Subway for lunch,” Martavion says repeatedly until his mother, Shehina Tinnel, gently shushes him. “We’ll talk about that later,” she says. Transplant patients like Martavion—and other patients with weakened or suppressed immune systems—may not be able to fight infections caused by food contaminated with bacteria, so they are advised to avoid raw fruits and vegetables that haven’t been washed by the family. Now that he is a year out from transplant and doing well, Martavion can stop taking the medications that suppress his immune system—and start eating fast food sandwiches topped with lettuce and tomatoes, Kitko tells him. “I’m having Subway for lunch,” Martavion says with another cheer. 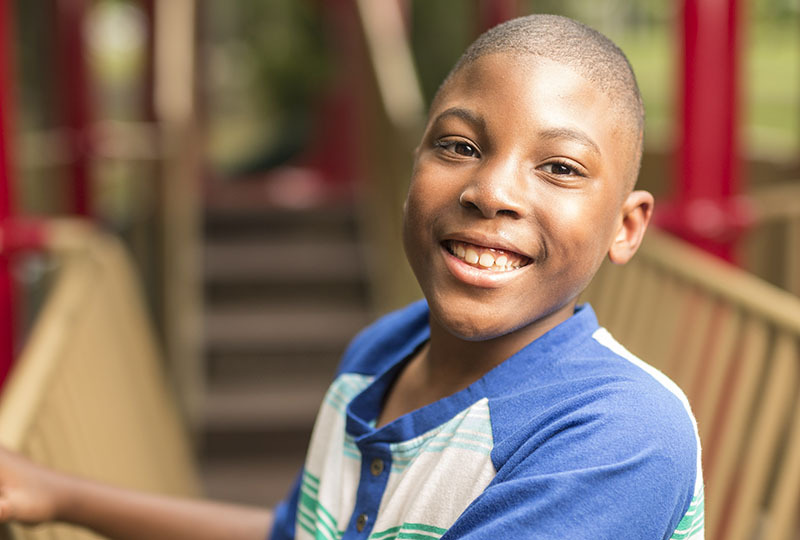 Martavion came to Monroe Carell Jr. Children’s Hospital at Vanderbilt from his home in Sledge, Mississippi, about 60 miles south of Memphis, for an unusual type of bone marrow transplant: a haploidentical—half-matched—transplant. His mother was the donor. Haploidentical transplants are one example of the unique offerings that distinguish the program at Children’s Hospital from others in the Southeast. “Our stem cell transplant program is really world-class. It will continue to grow and be a destination for patients because of the compassionate family-centered, multi-specialty care all under one roof at Children’s Hospital, led by internationally recognized physicians who provide access to novel clinical trials,” says Debra Friedman, M.D., director of the Division of Pediatric Hematology/Oncology and E. Bronson Ingram Professor of Pediatric Oncology. “This is a unique combination that is not found in any other center in Tennessee. Martavion Tinnel was born on a sultry August day in 2007, nearly 10 weeks before his due date, weighing 1 pound, 12 ounces. Martavion’s mother expected him to have complications related to the preterm birth, but she says she got a shock when a genetics specialist from the health department came to visit her at home after discharge from the hospital. The specialist told her that Martavion had sickle cell disease, a common inherited red blood cell disorder. Because sickle cell disease is diagnosed in about 1 in 500 African- American babies, it is part of the routine newborn heel stick screening in all 50 states. People with sickle cell disease have an abnormal form of hemoglobin, the oxygen-carrying protein in red blood cells. This hemoglobin S, or sickle hemoglobin, can form stiff rods inside red blood cells and change their shapes—from flexible discs that move easily through blood vessels to sticky, sickle-shaped cells that do not. The sickle-shaped red blood cells block blood flow and cause pain crises, which can require hospitalization. Blockages in the lungs cause a pneumonia-like acute chest syndrome; blockages in the spleen impair immune system function; and blockages in the brain cause strokes. He began receiving blood transfusions every three weeks to suppress the formation of his own sickled red blood cells and hopefully prevent further strokes. Still, he continued to experience strokes and seizures, and he developed Moyamoya disease—a tangle of tiny blood vessels in the brain—from the blocked arteries at the base of the brain. Revascularization surgery to restore blood flow to his brain left long scars on both sides of Martavion’s head. While Martavion’s condition stabilized, monthly blood transfusions are problematic and introduce extra iron that the body has trouble eliminating. Over time the body becomes iron overloaded, which is a difficult problem to treat, Kitko says. “It got to the point where there were no more surgeries we could do, and transplant was the only option,” Shehina Tinnel says. Bone marrow is the soft spongy material inside bones. It contains immature cells called hematopoietic—blood-forming—stem cells that can divide to produce more stem cells or mature into all of the types of blood cells. Stem cell transplantation is a procedure in which healthy stem cells are isolated from bone marrow, circulating blood or umbilical cord blood and are infused to replace damaged or diseased blood-forming cells. The transplant of the stem cells happens like a standard blood transfusion. Stem cell transplants are used to treat a variety of conditions including cancers, blood disorders like sickle cell disease and bone marrow failure, immune system deficiencies/dysregulation and metabolic diseases. Vanderbilt’s transplant physicians include Kitko, who focuses on malignant diseases, Jim Connelly, M.D., an expert in non-malignant diseases, particularly immunological diseases, and Richard Ho, M.D., who conducts basic science research on the variable responses of patients to drug therapy in pediatric oncology and stem cell transplantation in addition to caring for patients. Transplants for non-cancer diagnoses are expanding at Vanderbilt and nationwide, Friedman says. A transplant may use a patient’s own stem cells (autologous) or stem cells from a donor (allogeneic). For allogeneic transplants, donor cells are carefully matched to the patient: proteins called human leukocyte antigens (HLA) are compared, and a perfect match, 10 out of 10 HLA proteins, is used if possible. A sibling has a 1-in-4 chance of being a match, but often patients need to turn to the national registry of donors to find an unrelated donor. Patients with sickle cell disease face particular barriers to finding a matched donor. The possibility that a sibling will also have sickle cell disease reduces the chance that a sibling will match to about 15 percent, Kitko said. Also, sickle cell disease is more common in people with African ancestry, but only about 30 percent of African-Americans will find a match in the national marrow registry. Vanderbilt’s experimental protocol for haploidentical transplants widens the potential donor pool for patients. All parents and children are “half-matched” because a child inherits half of the 10 HLA proteins from each parent. Johns Hopkins University investigators pioneered the use of haploidentical transplants for older patients with leukemia and lymphoma who had no perfectly matched donors. At Vanderbilt, Adetola Kassim, MBBS, associate professor of Medicine, was instrumental in developing the haploidentical transplant protocol for sickle cell disease. But access to the experimental approach is still limited. Martavion’s physicians at St. Jude Children’s Research Hospital in Memphis referred him to Children’s Hospital. Becky Manes, R.N., MSN, CPON, is often the first person patients and families encounter in the Pediatric Stem Cell Transplant Program. For patients already at Children’s Hospital and for those referred by regional physicians, she coordinates all aspects of the evaluation each patient receives prior to transplant. “We utilize almost every service—cardiology, pulmonology, nephrology, infectious disease, radiology, pathology, Child Life—because we have to know everything about a patient going into transplant so that we know how to best take care of them,” says Manes, Pediatric Stem Cell Transplant Coordinator. Manes also manages the evaluation process for related donors. “I make a lot of phone calls,” she says with a laugh. hospitalized until about four weeks after transplant. They are required to remain in the local area until 100 days after transplant. The Children’s Hospital team helps arrange lodging for families who don’t live nearby. Martavion and his mother stayed at the Ronald McDonald House. During the inpatient hospital stay, floor nurses with “extensive experience with transplant” take care of patients during the preparative regimen and after the stem cells have been infused. Many of the nurses, who are chemotherapy- and biotherapy-certified, have worked with stem cell transplant patients since Vanderbilt started offering the procedure in the late 1980s, Manes says. Manes has been involved with the program since its inception. “I still have patients from years and years ago who call me about concerns or life changes, because I was their contact person through the transplant process,” she says. Having experienced nurses and a hospital full of experts is important because complications are common for transplant patients, Kitko says. “With transplant, lots of things can go wrong with almost every organ system in the body,” Kitko says. “We have a great complement of subspecialists at Vanderbilt who can help us make sure that these kids are treated in the best, most comprehensive way possible. The most common complication following a stem cell transplant is called graft-versus-host disease (GVHD). GVHD comes in two forms—acute and chronic—and Kitko is internationally recognized for her expertise in studying and treating both forms. Chronic GVHD generally starts after the first 100 days post-transplant, and can have symptoms affecting any part of the body. Patients at Monroe Carell Jr. Children’s Hospital at Vanderbilt with a certain type of leukemia will soon have access to a clinical study of a novel immunotherapy. Kitko has focused on understanding which patients get GVHD, and how to predict and treat it sooner. At the University of Michigan, first as a fellow and then as a faculty member, she worked with a team of investigators to discover blood biomarkers for acute GVHD. “As early as seven days after transplant, when the transplanted bone marrow hasn’t even started producing new cells, we can already see signs of inflammation that correlate with the patient’s chance of getting GVHD,” Kitko says. Now, the biomarkers they discovered are part of a panel that can be used to calculate a risk score—the Ann Arbor GVHD score—that predicts which patients will need early and aggressive treatment. Kitko is leading Vanderbilt’s participation in two national studies using the biomarker panel to help determine treatment for GVHD, and she is developing a trial aimed at preventing GVHD in patients with high-risk markers at seven days after transplant. Kitko also is leading a multi-center study of extracorporeal photopheresis as a novel treatment for pediatric acute GVHD. Clinical studies are a strength of the Vanderbilt transplant program. “My goal—and our goal as a program—is to try and learn from every patient, and make treatment better for those that come next,” Kitko says. Kitko has a particular interest in chronic GVHD. She is developing both a pediatric chronic GVHD clinic at Vanderbilt as well as a consortium of centers to collaborate in following pediatric patients with GVHD and to build a biorepository of blood samples for future biomarker discovery. “Finding the right way to catch chronic GVHD early is essential to starting treatment earlier, and it will take a coordinated effort between centers,” Kitko says. Fortunately, Martavion avoided many of the complications of a stem cell transplant. He had “engraftment syndrome”—inflammation as the bone marrow began to work, but it responded well to treatment. He never developed GVHD. “His and his mom’s cells have come to be happy with each other,” Kitko says. His mother says he’s a different child. Kitko is clearly pleased with Martavion’s condition as she conducts his one-year post-transplant exam. The two share an easy rapport. She laughs at his silly jokes and asks about what he enjoys doing these days. Martavion tells her that he likes to watch videos on YouTube and play video games. He says that he’s going to a park after the exam and that he likes to climb monkey bars. He confides that he doesn’t climb high because he’s scared of heights. But today, he announces, he’s going to climb higher, and of course, have lunch at Subway.